Okay, I think I may seriously need to go to this event! Has anyone been? Locals? Have you taken part in this extreme pirate fun? Do you want to? Sounds great, I would be very interested if I was any closer than NH. i went a few years ago. it's mostly just a big party with people in costumes. oh! I looked at the link after i Posted about having gone. It looks like they have done some updating since I went. It actually looks like it might be fun now! My family has been heavily involved with reenacting both medieval and american civil war time periods. I would love to do golden age of the seas... but I live in inland Illinois. Not a lot of pirate reenactment in these parts. Though there are a couple of big crews a couple hours away closer to Lake Michigan. When I went it was more like a party in the sense of dressing like a pirate and getting obnoxiously drunk. It was sponsored by Captain Morgan.Garbage littered the street during the parade, people were getting sick in the lobby of the hotel we were staying in and it seemed like all anyone wanted to do was meet their own pirate wench. Now mind you I was in college so I made the best of it, but I don't think I would make a trip to Tampa for it. However, it does look a little more organized now from the website. I'm interested in hearing from a local. Was my experience not the norm? or is that what pirate fest is all about? Eeeew! You lost me at "getting sick in the lobby"
Drinking and meeting a pirate wench, aside from robbing and killing, isn't that what being a pirate is all about? So... maybe not the spot you want to take the kids. HAHAHAHA - Yes you are correct that is what being a pirate is all about. don't take the kids, but if you want to party go for it! It's actually turned into a month long celebration. The invasion and night parade are just pure drinking and partying and not appropriate for kids. Now they've added a children's parade during the day the weekend after, and there's a half and full marathon and some other races another weekend. I think there's a golf tournament and other activities, and they link them all to Gasparilla. Seems like it goes on for a whole month. We've never been but everyone I know goes to something. I'd love to see the pirate invasion but the thought of parking miles away to put up w thousands of drunks all over just doesn't appeal to me. It's been compared to Mardi Gras. I'm getting too old for that kinda fun. Kristen - I think I'm going to stick with the Pirates IN the Caribbean party you wrote about on the main WDW for Grownups page...that's the kind of fun I'm looking for!! I live near Tampa, but I've only gone once. Drunk people EVERYWHERE and girls dressed in barely there costumes. Not fun at all and it was highly overrated. Don't waste your time! Disney lover, dancer, cheerleader, and vegetarian. "Keep Adventuring and Stay Not a Grown Up"
Now that we live south of Tampa I looked into this a little further. They do it over 2 weekends - the first one is supposed to be more family friendly and geared towards kids, with a kids parade and activities. That sounds like so much fun! OK - honestly I would probably be completely overwhelmed and run for a quieter beach, but I do really like the idea. I suppose it could have been worse.....though watching it on TV, no way is the to go there. Just crazy!! 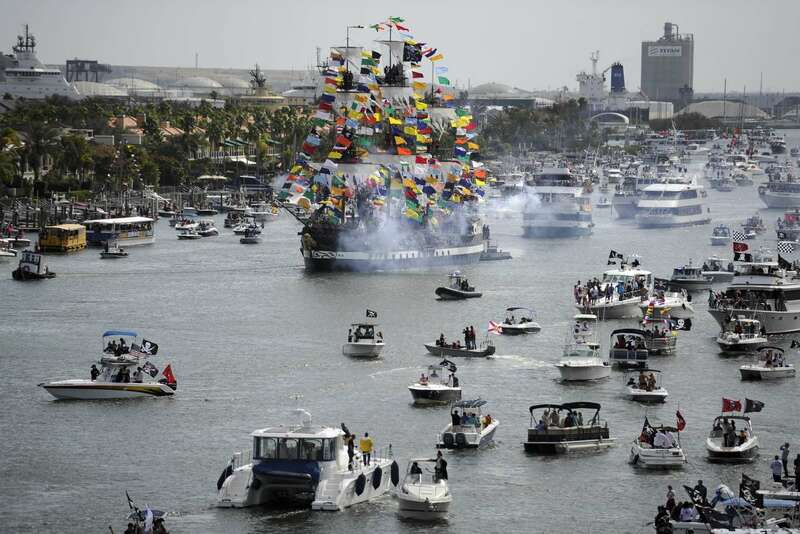 Eleven people were arrested Saturday during Gasparilla, and 38 got rides to the hospital. But there were no major incidents, according to a preliminary report by Tampa police. The arrests included five felonies: One for domestic battery and two for battery on a law enforcement officer after a man refused to leave when police asked him to. Another pair of men were arrested for criminal mischief after standing atop and damaging a Tampa police vehicle. Of the six misdemeanors, one was for obstruction, two were for underage drinking and three were for disorderly conduct, police said. The 38 medical transports Tampa Fire Rescue involved mostly minor injuries and were alcohol-related.